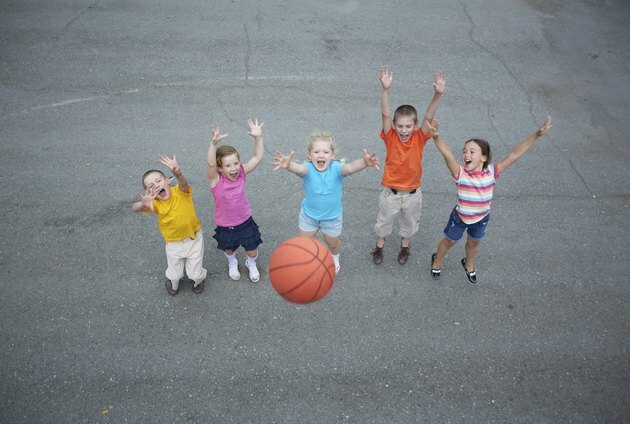 Basketball can help kindergarten-age children get some exercise while learning a new skill. According to Keven A. Prusak, author of "Basketball Fun and Games: 50 Skill-Building Activities for Children," basketball drills for children in kindergarten should focus on learning the game rather than competition. Choose drills that allow each player to practice multiple times to help build skills and encourage everyone to be successful. The Fingertip Drill teaches kindergartners to handle the ball well so they are able to hold onto it during play, according to Burrall Paye and Patrick Paye, authors of "Youth Basketball Drills." Line players up on the court with a basketball in their hands. On your mark, instruct each player to pass the ball back and forth between his hands. Teach the kindergartners to aim their passes accurately so they do not drop the ball. As players grasp the skill, encourage them to pass the ball down low and then up high to help simulate the way they will handle the ball during games and competitions. According to Jim Garland, author of "The Baffled Parent's Guide to Great Basketball Drills," dribbling while in a stationary position can teach kindergartners to master the skill of dribbling before they have to move and dribble at the same time. Scatter the players around one end of the basketball court, and give each one a basketball. Show players how to dribble using one hand as well as switching between hands. As kindergartners become advanced at dribbling, you can teach them to dribble between their legs and to dribble in a figure-eight formation. Once a player is proficient at dribbling, have him move around while practicing. The Triangle Passing Drill teaches kindergartners how to pass the ball accurately to other players on the court. Divide the players into groups of three. Place three markers on the basketball court in a triangle formation. Allow one triangle for each group of three players. Each player stands on one of the markers in the formation. Give two of the players in each triangle a basketball. The first player passes his ball to the player without a ball while the remaining player passes his ball to the first player. The kindergartners must keep both balls in play throughout the duration of the drill. Encourage players to keep their eye on the ball so they are better able to catch the pass and then pass it on. Keep the drill going for three to five minutes.